Christmas is approaching, less than 1.5 months away. It is time to start prepare Christmas cuisines. 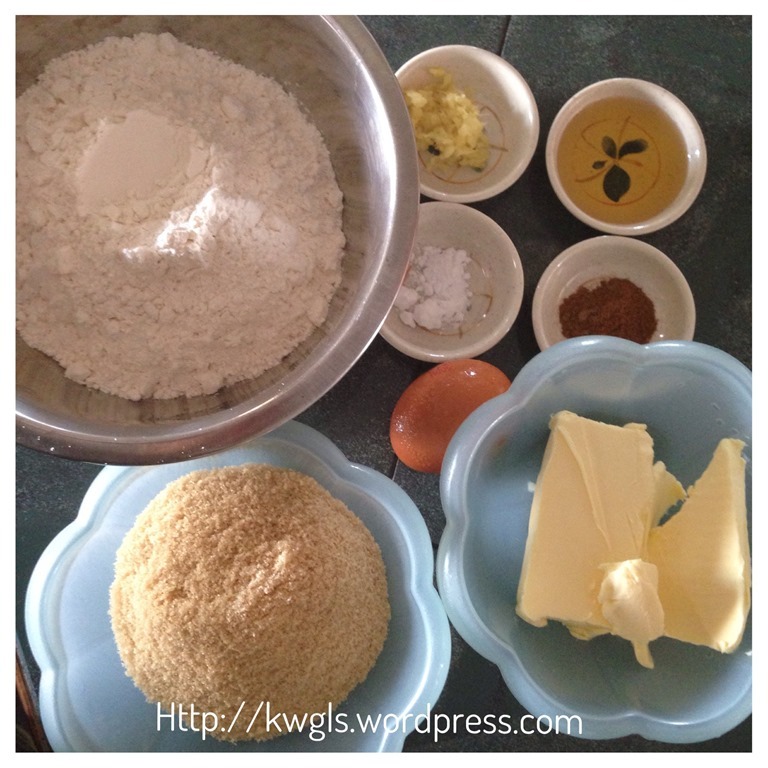 I have a post on Christmas Boiled Fruit Cake in early October 2013 and I believed that is the right time to get ready the fruit cakes for Christmas purposes. More of more post on Christmas cuisines will be coming soon and next in the pipeline will be another fruit cake that I am going to prepare for my relatives to bring back to their home town. Being an Asian and non-Christian, I don’t really celebrate Christmas though I have fond memories of my childhood years where my brother and I always spent our Christmas eves in one of our families’ friends house. Prior to the Christmas eve gathering, we were busy buying presents for gift exchange but the dinner we had were not really a Christmas dinner. It is just a normal buffet spread. Therefore, I am rather ignorance on authentic Christmas celebrations. 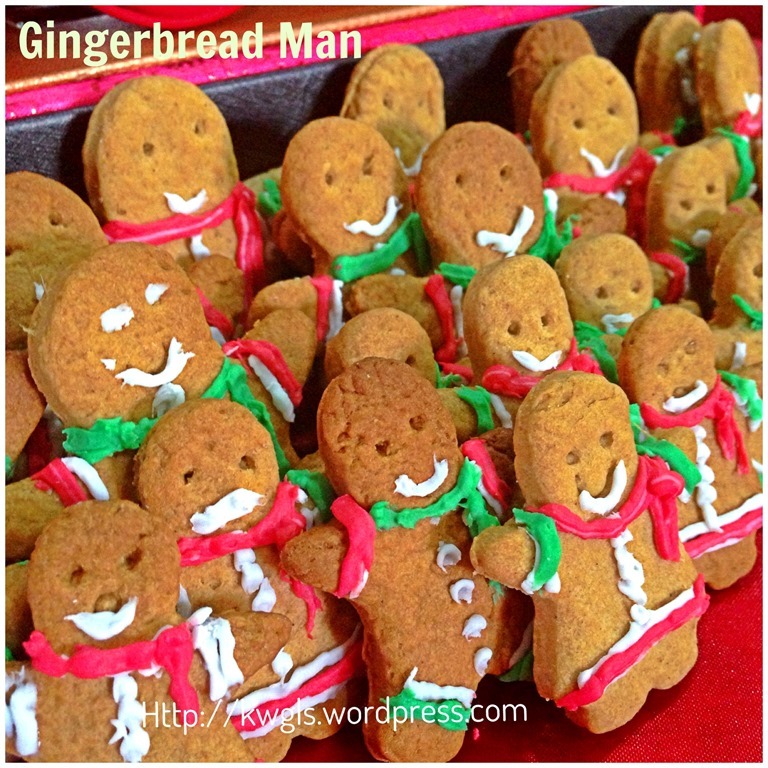 It is common to see gingerbread man in Christmas decorations in the shopping arcades in Singapore and Malaysia but the very first time I got in touch with the gingerbread man was about 6-7 years back where I celebrated Christmas with my family in Kuala Lumpur. 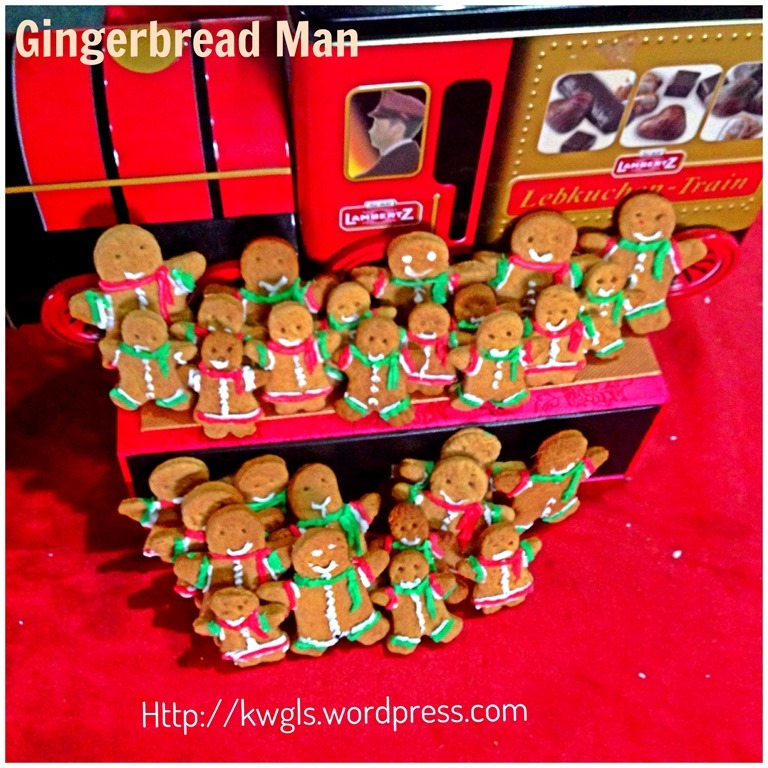 At that time, my girl is only 4 years old and in the shopping centre that we shopped, the shopping centre has organised some fun activities for the kids and all kids were invited to participate in the making of gingerbread man. After the activities, she brought back a big gingerbread man and she made and that was the first time I tasted the biscuit. It is fun and easy to make the biscuits. 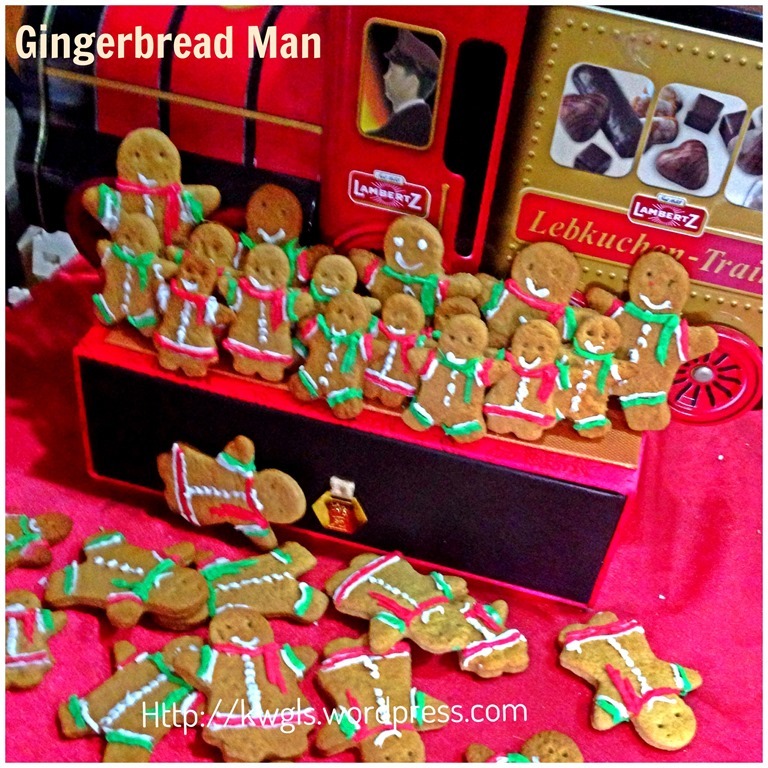 You may want to consider making some of these biscuits as Christmas gifts to your friends. The recipe covers the making of the basic biscuits and will not cover in detail the icing and decorations of the biscuits. I have used some royal icing and pen writing nozzles to decorate the biscuits. That is not perfect as icing is not my area of strength. Note that in this illustration, I did not add in any sugar as I want it to be just plain biscuits like the saltine biscuits. You can add in the sugar of the quantity that you prefer. Preheat the oven to 180 degree Celsius and line 2 baking trays with parchment paper. Put all the dry ingredients (butter, ginger, flour, baking soda, minced ginger and mixed spice) and pour into the bowl of a food processor. 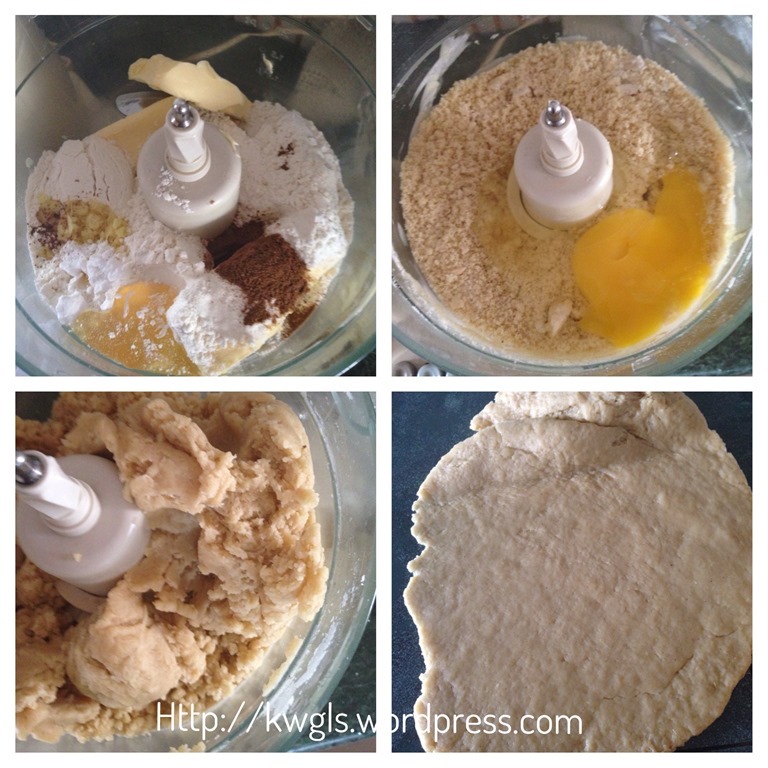 Blend until the mix looks like breadcrumbs. Add in lightly beaten eggs and golden syrup. Continue to blend or pulse until the mixture sticks together become the dough. 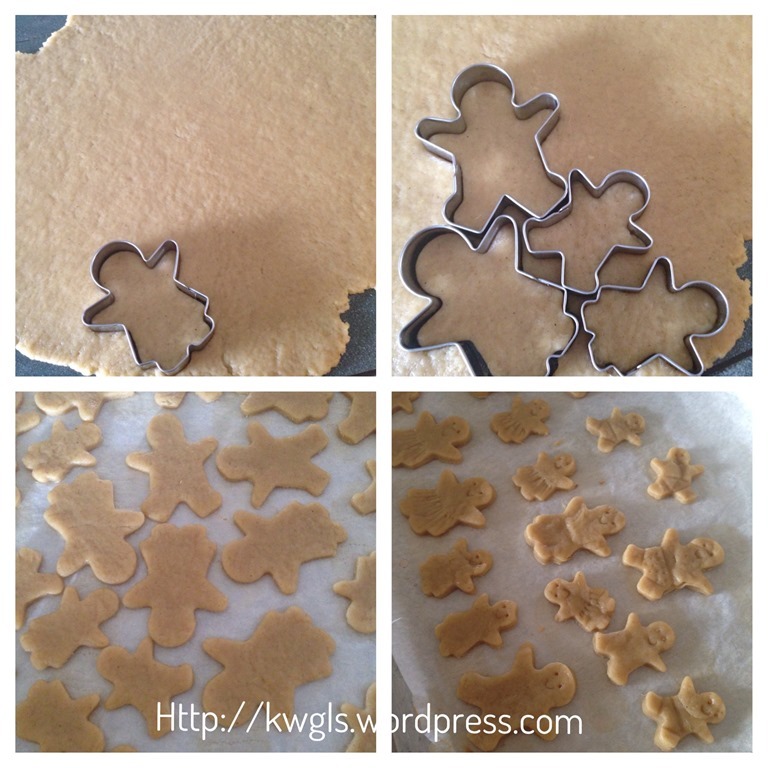 Take the dough out and roll into 0.5 thickness flat sheet. 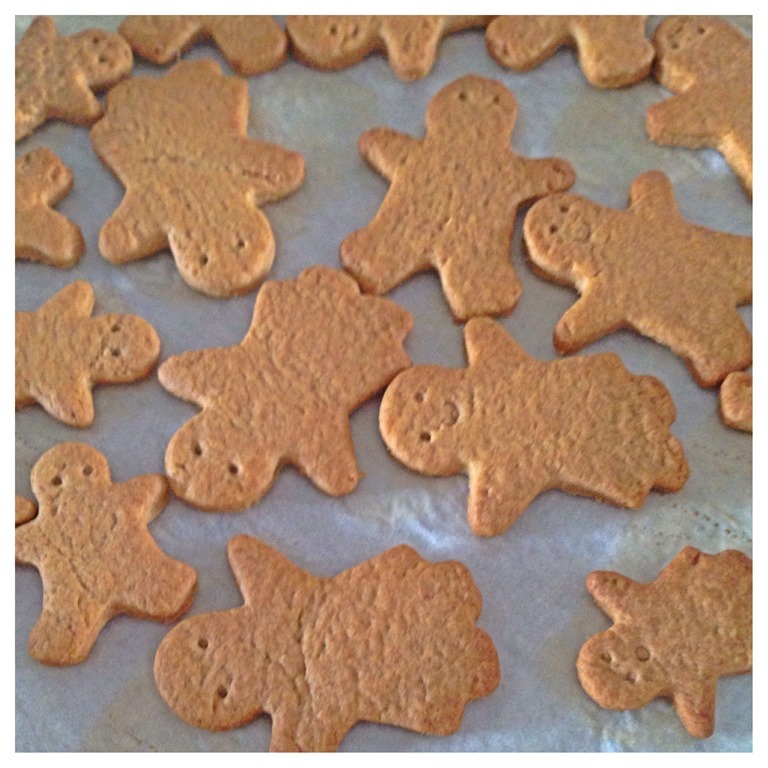 Use the gingerbread man cutter to cut out the shapes and place on the baking tray and leaving some space between them. Bake in the oven for 12-15 minutes or until the biscuits turn light brown. Leave on the tray for 10 minutes before moving to the wire rack for cooling. Let it cool completely before decorate the gingerbread man. Get ready 9 tablespoons of royal icing (I bought the ready made icing) and divide into 3 portions. Add some red colouring to one portion and green colouring to another portion. Stir well and you should have 1 portion of white icing, 1 portion of green icing and 1 portion of red icing. Put the icing in three icing bag with either a pen writing nozzle or cut a small hole in front of the icing bag. 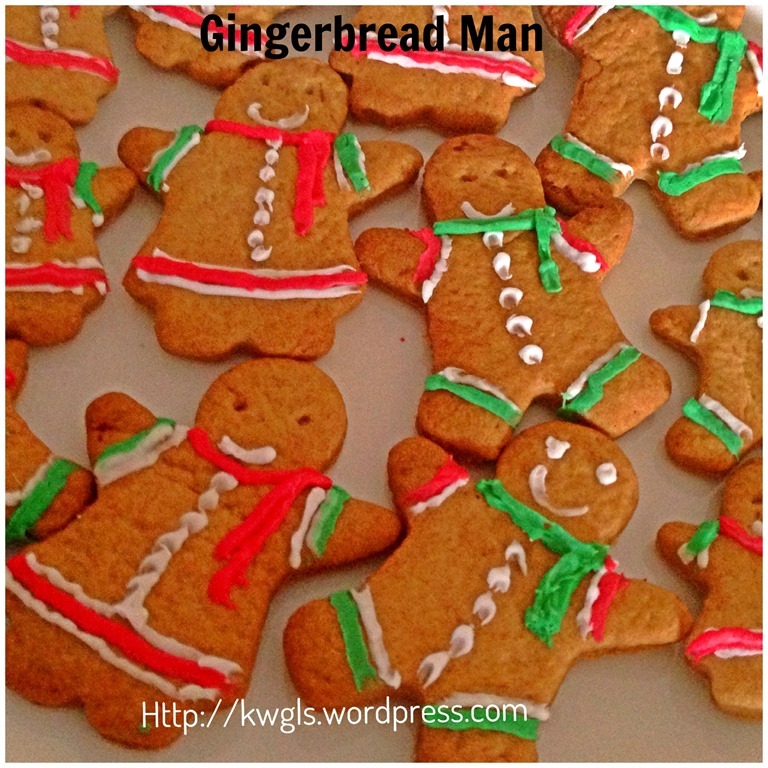 Decorate the gingerbread man to your desired pattern. 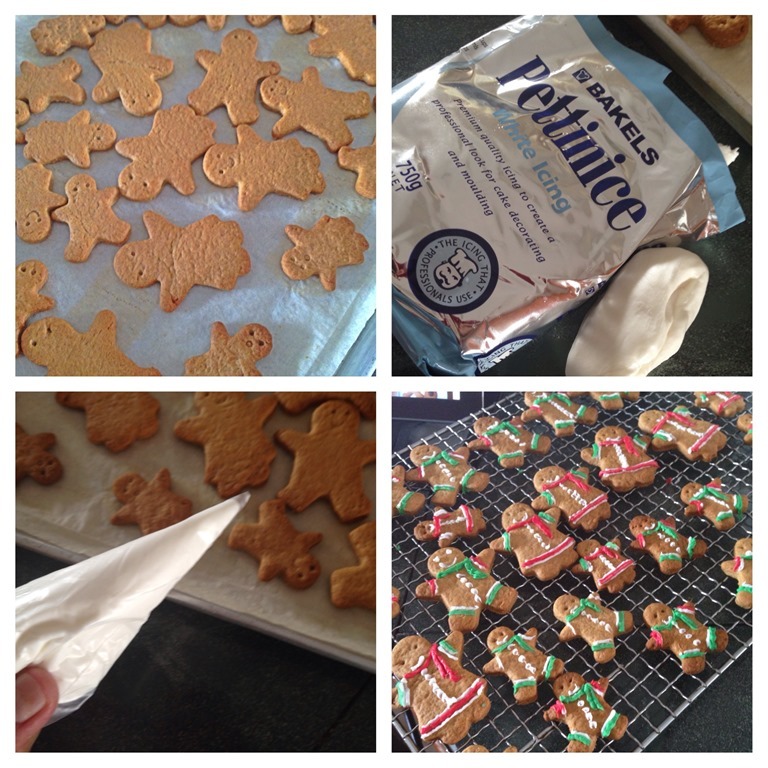 If the purchased icing is too dry (meaning hard to pump out), add a “DROP” or two of water to the icing before pumping. Store in an air tight container for up to 2-3 weeks. For me, I love the taste of the biscuits. It is quite addictive though it is just plain biscuit with cinnamon and ginger aroma. 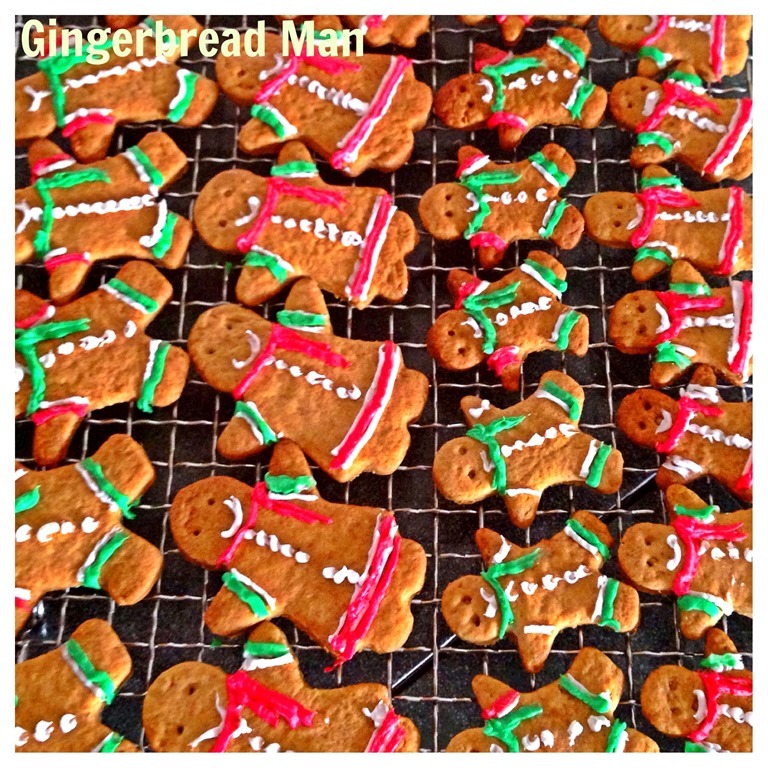 Pumping of icing is my weakness and I am sure you can create much better looking gingerbread man than me ..May be it is time for you to get ready making some gingerbread man biscuits as your Christmas gifts. Hope you like the post today. Cheers and have a nice day. 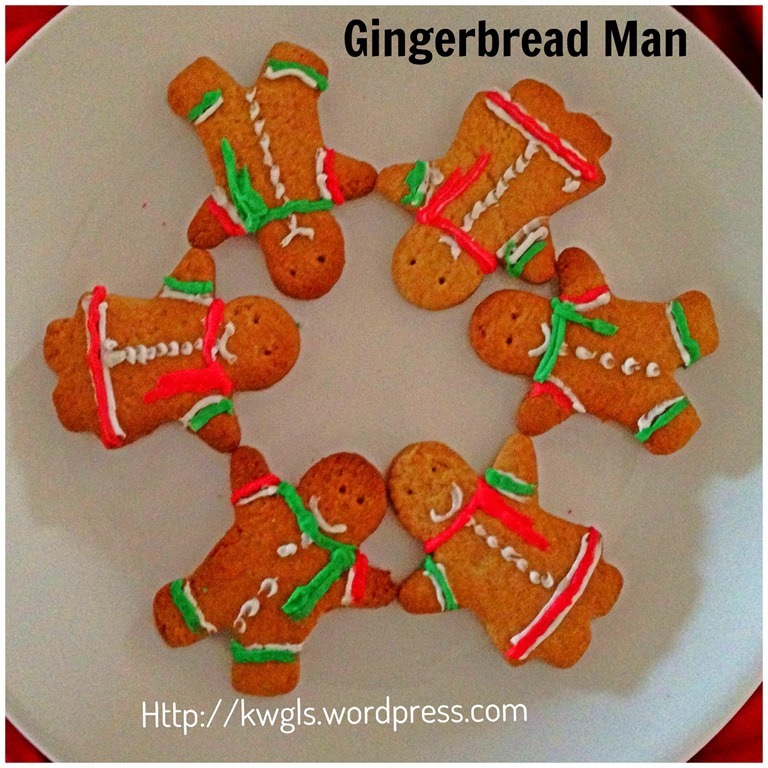 This entry was posted in Cakes and cookies, Food Preparation Series and tagged 8, christmas 2013, gingerbread man, Guaishushu, postaday. Bookmark the permalink. Love the icing. You’re so good with your hands. I can imagine what mine would look like if I attempt to do it. LOL!!! 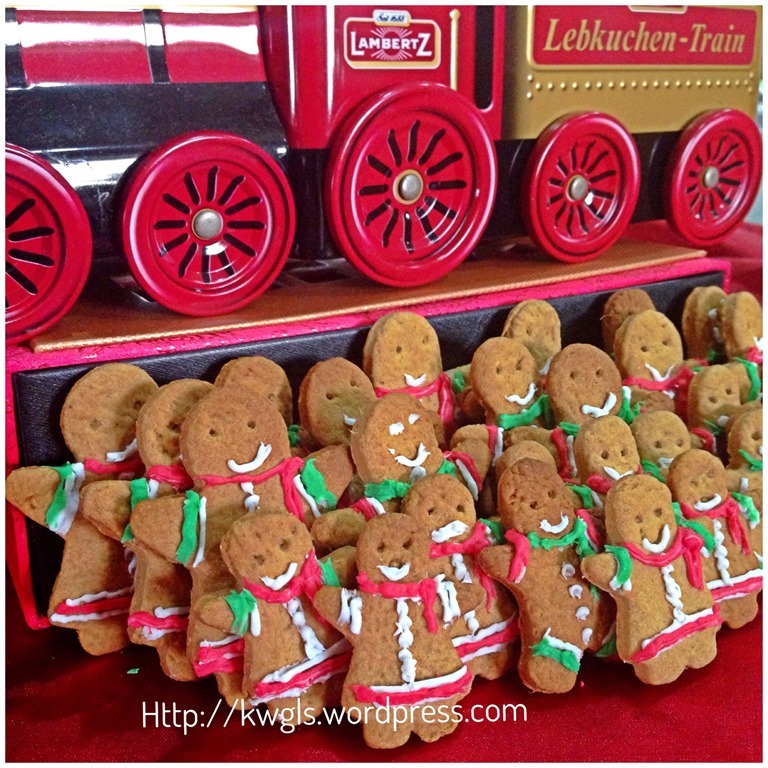 Kenneth these are very cute and love the idea of them protecting the train. Very cute and the decorations is very detailed! Thanks for sharing on the Four Seasons Blog Hop!